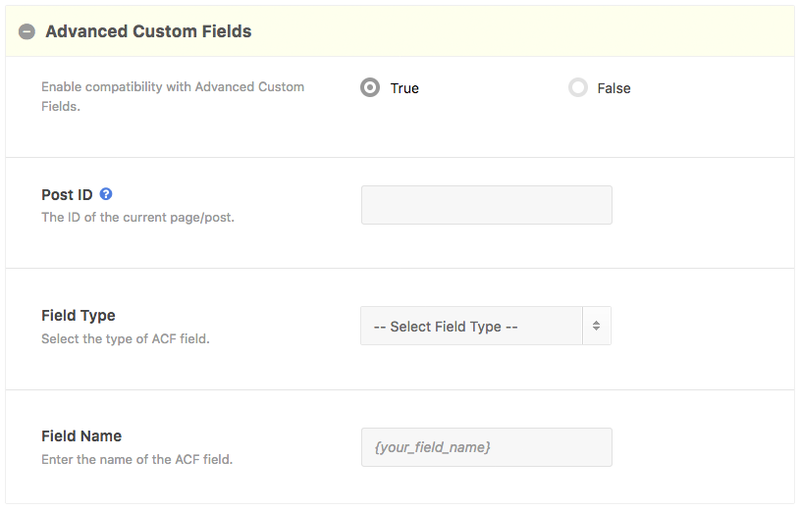 The Advanced Custom Fields extension provides infinite scroll and lazy load functionality for various field types for Advanced Custom Fields. The extension allows you to quickly and easily access Advanced Custom Fields data for a page, post, custom post type or taxonomy and return the results to Ajax Load More for infinite scrolling. By utilizing a library of custom WordPress hooks, filters and queries, the extension is able to retrieve custom field data from a post and display the results via infinite scroll with Ajax Load More. Note: This extension is available for users running ALM 3.0+ and ACF 4.0+. Use the following shortcode parameters to initiate the Advanced Custom Fields extension with Ajax Load More. The following screenshot illustrates the process of building a shortcode with the shortcode builder.